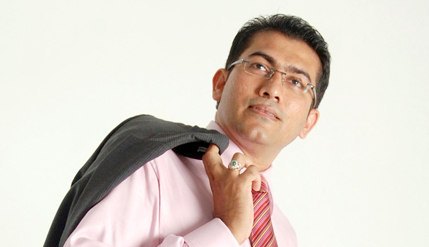 BANGI, 14 Apr 2014 – A motivational expert and trainer has suggested university graduates take up businesses rather than merely becoming employees with fixed incomes. A training consultant and principal trainer and CEO of SK Training Academy Sdn Bhd Shamsuddin Abdul Kadir said being employed was more risky and can cause more misery compared to doing business. Giving his motivational talk at the National Young Entrepreneurs Summit (NYES) 2014 organised by The National University of Malaysia (UKM) here recently, he said a misery to happiness index showed employed people suffered 9 times more misery than business people. It was found that employed people were packed into fixed working hours thereby having to face being stuck in traffic jams going to and from work every working day with all the other employed people. The NYES 2014 was organised by the Aminuddin Baki Residential College of UKM and UKM’s Centre for Entrepreneurship and SMEs Development (UKM-CESMED). It is aimed at gathering young Malaysian entrepreneurs from the universities in an effort to produce students with creative, critical and global mindset on entrepreneurship. About 200 students from 42 local public and private universities attended the event, which was opened by Deputy Vice Chancellor (Academic and International Affairs), Prof Ir Dr Riza Atiq Abdullah OK Rahmat. Shamsuddin encouraged young entrepreneurs to create new opportunities instead competing with existing enterprises as that would only make them face stiff competition. However, he reminded them that about 90% of new businesses fail in the first three years because they do not have back-up plans. As a result many of them just gave up when their businesses did not make profits because they do not have alternative plans for replacement. The key to creating great ideas for successful business was by doing a lot of research before hand and venturing into new opportunities that have not been done by others, he said. Shamsuddin also encouraged budding entrepreneurs to start their own business instead of being employed in salaried jobs. He also advised those going into business to always remember to be likeable to all as that would help their business since “people buy products from those whom they like”. Another speaker was Datuk Dr. Maznah Hamid ‘The Iron Lady’ owner of Securiforce Sdn Bhd. Also present was the Deputy Director of UKM-CESMED, Associate Professor Dr Aini Aman.